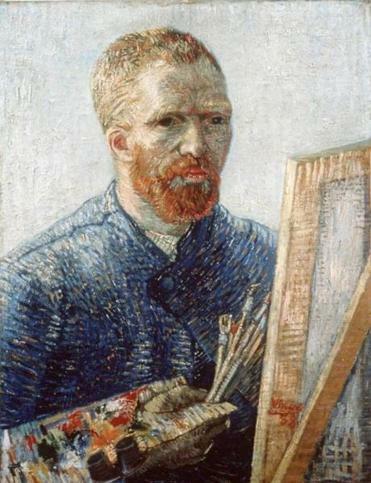 Vincent Van Gogh’s "Self Portrait as an Artist." Before Vincent van Gogh flowered as a painter, goes the historical boilerplate, he flopped at nearly everything else. Early education was a misfit’s maelstrom of skipped classes, school yard fistfights, and corporal punishments. He was peremptorily fired after promising beginnings at a Parisian art gallery, where he had trouble concealing his disdain for his clientele’s tastes. His campaign for the affections of his Parisian landlady’s daughter was rebuked (the previous tenant had first dibs). And a year at an Amsterdam theological school (where he hoped to emulate his minister father) ended in failure, as did a nine-month stint as a lay clergyman to faith-wary coal miners in Belgium. This last misadventure has galvanized the curiosity of novelist Nellie Hermann, whose imagination has been liberated by the paucity of accounts that endure from that chapter of van Gogh’s life. Significantly, the prodigious body of letters from the budding artist to his younger art-dealer brother Theo that has provided grist for a legion of biographers, along with Irving Stone’s 1934 novel “Lust for Life,” ground to a halt in the late summer of 1879, a break that continued for almost a year after van Gogh’s arrival in the Belgian coal-mining village of Petit Wasmes. With a nose for eloquence exceeded only by her chutzpah, Hermann blends in chunks of actual “Dear Theo” correspondence bracketing van Gogh’s Petit Wasmes residence with fabricated letters to flesh in the painter’s service as minister manqué. The somberly engrossing result, “The Season of Migration,” is a risk-taking hybrid, part epistolary impersonation, part act of biographical second-guessing, postulating van Gogh’s abbreviated ministry as an epiphanic sojourn toward self-definition, during which he grows comfortable with the possibility that his own art could be a marketable commodity and, perhaps more discomfitingly, that his kid brother might benefit him as an ATM machine in service of Vincent’s incipient painting career. Asserting the transitional resonances of her title, Hermann frames her narrative with a punishing trek (written in a trudging third-person present) that her subject undertakes from Belgium to his brother’s apartment in Paris in 1880, months after he has been deposed from his ministerial assignment. In this allegorically suggestive journey, the indigent van Gogh remunerates acts of kindness from strangers with tossed-off sketches, and carries an accumulation of letters that he hopes will disabuse Theo of his contention that Vincent is an “idler.” In these fictive letters, van Gogh details the hardscrabble lifestyle of the coal miners, who commonly begin their grueling underground livelihoods at the age of 8 and expire at 40. Van Gogh initially revels in the middle-class comforts provided by his hosts, the baker family Denis, only to reject their hospitality after he is taken on a revelatory, skin-scorching tour of the mines (relayed with vividly grim particulars that honor Émile Zola’s “Germinal,” which the author used as research material). Newly determined to suffer like his congregants (“God is in the gloom,” he writes Theo), van Gogh gives away his clothes and moves into a minimalist hovel, provoking protestations from his father and the ire of the overseeing evangelism committee, who, after crashing a mass memorial service for victims of a horrific mine explosion, dismiss him for his “savage” and “un-Christian”-like demeanor. Was there perhaps some Method acting in the Christ-like madness of van Gogh’s asceticism, or did he simply inhabit his holy vocation with the same obsessive commitment to embodying emotion states that he would channel into painting? Hermann makes a convincing case that van Gogh was actually one helluva Bible thumper and teacher. But for a gross administrative miscalculation on the part of his evangelical bosses, he could have credibly grown into his role as coal-town prophet, and the crude early drawings he traded for the kindness of strangers would never merit the celestial price tag they fetch today. 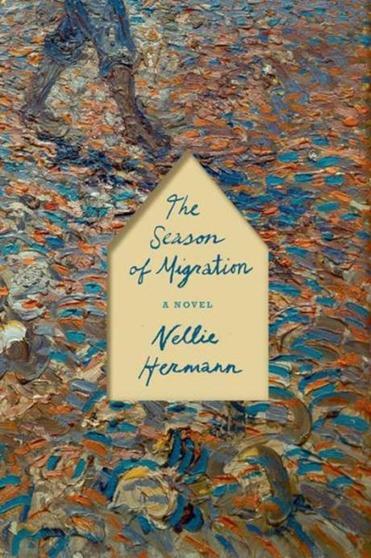 “The Season of Migration” covers a lot of territory and characters with an admirable economy of means. Given the counterfeit nature of the “Dear Theo” letters, one doesn’t always know whether to credit the author or her protagonist for the many flights of elegant prose, or which one to blame for semi-colons and overwriting, e.g. the coal mine “loomed up out of the landscape like some magnificent mythical metal minotaur,” or elsewhere the painter’s insistence that he was so excited by his first dinner in Petit Wasmes that “instead of food, I ate the sky.” Personally, I prefer to think that van Gogh cleaned his plate, and left the sky to his palette.